Political rhetoric has reached new boiling points during the 2016 Election season. Intense hatred for Hillary Clinton on the Republican side is matched by intense fear of a Donald Trump presidency on the Democratic side. The difference is that pro-Trump supporters may now be surpassing pro-Clinton supporters in their fervor. Donald Trump, in his version of authoritarian populism, has convinced them he can fix all their problems. His supporters also believe Clinton is untrustworthy, that she is guilty of crimes for which she escapes serious consequences others would not escape – even for the same offenses. There are also millions of fiercely unhappy Bernie Sanders supporters (including Independent voters) who long suspected a stolen election and now get more confirmation each day, most recently on July 22nd from hacked emails released by Wikileaks. They show that the Democratic National Committee (DNC) did indeed sabotage the Sanders campaign to an extensive degree, violating their own bylaws by acting from the start to discredit and defeat him. In response, tens of 1000s of Sanders supporters marched and protested in Philadelphia outside the convention hall and 100s of them inside the convention hall staged a walk-out after the roll-call nominating Clinton on Tuesday night, July 26th. Protests continued throughout the week of the Democratic Convention. The Wikileaks emails also showed how the DNC did some convenient money laundering to aid Clinton and circumvent campaign finance laws. A “Hillary Victory Fund” was designed to help local and state Democratic committees, though only .056 % of the $142 million raised over 10 months, from Sept. 2015 to June 2016, actually stayed with the state committees. Deposited there briefly, it was then funneled back into the Clinton campaign primarily, and also the DNC accounts, thereby shielding donors who had already given the maximum to the Clinton campaign. A May 2, 2016 article in Politico exposed the operation, but corporate media ignored the matter, along with minimizing Clinton’s FBI criminal investigations, which on July 5, 2016 predictably declined to indict her on one of them. The other is rarely discussed. In the short term, we look to transiting Mars and Saturn both in Scorpio (sidereal zodiac) for much of the year up to Sept. 17, 2016, with Saturn in Scorpio until Jan. 27, 2017. From Dec. 26, 2016 to Jan. 27, 2017 Saturn transits the treacherous gandanta degrees of Scorpio (the last 3 degrees 20 minutes). And in summer 2016 Mars and Saturn come to their exact conjunction Aug. 23rd at 15:47 Scorpio. This is preceded by the Saturn Stationary Direct Aug. 13th at 15:42 Scorpio, made all the more potent by occurring within one degree of the previous Mars Stationary Retrograde at 14:49 Scorpio, April 17, 2016. A planet is stronger than ever in its inherent nature in its Stationary position, and a degree area so emphasized provides a powerful trigger. In turn, all of these events receive further attention by being Vargottama, a Sanskrit word meaning “the best division.” In Vedic astrology, it refers to the degree area that repeats in other divisional charts, notably the Navamsha (9th harmonic) chart. In the fixed signs this occurs between 13:20 and 16:40 degrees of Taurus, Leo, Scorpio or Aquarius. A planet Vargottama in Scorpio gains extra strength and prominence in the Mars-ruled sign of Scorpio and in the Saturn-ruled nakshatra of Anuradha, (3:20 to 16:40 Scorpio). Further, when sign lord Mars is situated in this degree area along with another classic malefic planet (nakshatra lord Saturn, in this case), it amplifies the potential for aggressive action that is likely to be emotionally generated, since Scorpio is a fixed watery sign. Meanwhile, Hillary Clinton has natal Mars and Saturn in Cancer, another watery sign, in the 10th house; and though Mars-Saturn can be a revolutionary combination, Clinton is the antithesis of revolutionary, running as the Establishment candidate trying to appeal to voters as “the change-maker” against the insurgent Trump. Sanders and Trump supporters shared their opposition to Clinton. And now Sanders supporters are angry at a Democratic establishment who they believe robbed their candidate of the nomination and distrustful of a corporatist nominee, while Republicans are angry at immigrants and trade deals such as NAFTA and the TPP they see as causing their loss of power and security, both economic and physical. All this is happening against a backdrop of terrorist events or terrorist-like events occurring with greater frequency both nationally and globally. Mars is the warrior, the police. Trump promises more militarization to maintain control over potential terrorists and illegal immigrants, among others, though Clinton too – despite her rhetoric – has a strongly militaristic track record, and looks likely to back the TPP (Trans-Pacific Partnership), a trade deal she had opposed during the campaign against Sanders. Whatever the “spin” may be, too many of her biggest corporate backers support it, and Clinton insider Terry McAuliffe said July 26th she would likely support it. As noted, Scorpio is a fixed sign, and the Sanskrit word sthira means also stationary or still – an oxymoron for Scorpio – often characterized by a seething, volcanic kind of energy when prominent. This energy can erupt suddenly, having been in the molten lava stage for some time; and in human terms such an eruption may not necessarily lead to clarity and enlightenment but to further confusion and real damage on many levels. Thus, with Scorpio, we should pay close attention to what lies hidden or unacknowledged. So just like molten lava threatening to unleash itself, this planetary and real life scenario reflects a seething cauldron. The Establishment and its lackeys in the corporate media are trying to keep a tight lid on any topic threatening to undermine the status quo, including the burgeoning election fraud lawsuits and the collusion between the DNC, the Clinton campaign and its media surrogates. But important information has come out, mainly due to the hacked DNC emails, and Julian Assange of Wikileaks promises more of them to come very soon. The emails have created outrage, with official blame and attention going first to the hackers (possibly Russian), rather than to the content of the embarrassing emails. The DNC hopes that a public apology to Bernie Sanders and a brief slap on the wrist for the DNC chairwoman will minimize the real “coup d’état” that has occurred. But so far very little has changed. The DNC Chairwoman now assumes the role she essentially held throughout 2015-2016: honorary chairwoman of the 50-state Hillary Clinton campaign. Political theorist Sheldon Wolin (1922-2015) calls the U.S. “inverted totalitarianism,” a system in which corporate power has seized all of the levers of control. We see this forcefully in action in 2016, with the huge vote fraud issue and no corporate media covering it to date. We also note Hillary Clinton’s Vice Presidential pick of Tim Kaine, the corporatist/militaristic candidate who has opposed most progressive economic policies, including raising taxes on millionaires. Donald Trump has vowed to fight the Establishment on behalf of the working class, but his lifelong actions as a businessman appear to contradict that rhetoric. He should have a better chance in this election as the one major party Anti-Establishment candidate, but his astrological timing after mid-August 2016 does not favor his victory in the presidential race. For more on this, see my “Trump it Up” article cited above. Much to the surprise of those who expected chaos at the Republican National Convention, and unity at the Democratic National Convention, the GOP Convention was smooth by comparison. It had only a minimal amount of chaos within the convention hall and a minimal number of protests outside the convention hall, with only some two dozen arrests. Local and state police experienced a relatively calm few days, July 18-21, 2016. The planetary outlook is good for the start of the GOP convention Monday July 18, 12:50 pm EDT, Cleveland, Ohio. Virgo rises, with Moon in Sagittarius receiving a beneficial aspect from Jupiter in Leo. Moon in the 4th house from Virgo Ascendant is also Digbala, the best possible angular house for the Moon, and so is very well placed. Tr. Mars and Saturn are in the preceding house in Scorpio, and thus the Moon is not isolated. One positive factor about the Moon in this chart: it is in the 5th house, a trinal house, considered a fortunate placement. Most protestors have remained peaceful and none have been injured. Various citizens’ citations or even arrests might be expected, but the participants planned only peaceful demonstrations. Many protestors were wearing T-shirts reading “Democracy Spring,” and journalists started to call the Convention protests “Democracy Spring.” With Moon and Mercury both in the emotional watery signs, we would expect to see a lot of tearfulness and emotional display. This occurred not just from the legions of disappointed Sanders supporters, but from the exhilarated Clinton supporters thrilled to see their candidate nominated, especially as the first woman presidential candidate in U.S. history. With Scorpio rising and classic malefic planets Mars and Saturn in the Ascendant, we know that the Democratic National Convention would have a rough start, at the very least, with displays of acrimony and heated emotions throughout, more so from those feeling disconnected from the purpose of the gathering (isolated Moon). Indeed, some said there was more democracy on display OUTSIDE the Convention hall than inside it. Scorpio Ascendant indicates that much could remain hidden under the surface of this event. The unanimous ballot for Clinton came at 6:55 pm EDT Tuesday July 26, 2016, Philadelphia. The Ascendant is 17:47 Sagittarius, with tr. Moon at 10:13 Aries. Jupiter aspects both the Ascendant and the Moon, far more favorable than the opening chart for the convention, but hard to read as a super significant moment astrologically, other than to indicate that the protocol for the roll call would go smoothly. Husband Bill Clinton spoke at 10:11 pm EDT Tuesday July 26th, with 23:37 Aquarius rising and Ketu close to the Ascendant. With Ketu’s self-effacing influence he put himself in the background and his wife in the foreground, emphasizing their personal relationship, their 40-year marriage, and her strengths as he knows them best. An astrologer would agree with the choice of a Monday night slot and Pisces Moon, the sign of sacrifice (also Sanders’ birth Moon) for the speech of the candidate who many believe actually won but was forced to concede. Everyone agreed Sanders handled himself with grace and dignity, and that Tuesday proved smoother than Monday. On Tuesday the Moon in Aries was receiving Jupiter’s positive and uplifting aspect, though many protests would continue outside the convention hall and throughout the week, starting from the previous weekend. This mood would come from the opening chart for the convention, July 25th, with Scorpio rising. Tr. Moon remains in Aries Tuesday and Wednesday, but on Thursday, July 28th, the day Clinton accepts the nomination and gives her acceptance speech, tr. Moon is in Taurus opposite Mars and Saturn. This configuration indicates she would be likely to give a feisty speech, showing her warrior nature, ready for the fight. While not an ideal set of aspects for such a speech by the first female presidential candidate of the U.S., she is already placed in a combative role opposite Trump and faces fierce opposition. Her speech started at 10:29 pm EDT, with 4:39 Pisces rising, a placement that puts no planets in the angles of the chart and Moon in the 3rd house. Dressed all in white, she tried to strike a tone of authority and grace, but she is not a dynamic speaker and more of a policy wonk. With no planets in the angles and no planetary aspects to the Ascendant, she had no extra help from the planets. But with Moon opposite Mars and Saturn, she attacked her opponent many times in her speech, just as he had attacked her many times during his acceptance speech and continues to do so daily. Protestors walked out of the convention hall during her speech, with many 100s more protesting outside during her speech. At her unanimous ballot on Tuesday night, tr. Sun, Mercury and Venus in Cancer were in Clinton’s natal 10th house, an excellent indicator of prominent status career-wise. Trump was also nominated with Sagittarius Ascendant and within 4’ orb of the exact Full Moon in Capricorn. Both Trump and Clinton reached their respective unanimous ballots with no close aspects to the Moon other than an exact waning square to the Sun for Clinton, and nearly an exact Full Moon for Trump, echoing his birth chart. In many ways, it is considered that Trump has quickly taken over the Republican Party; and with Hillary Clinton, thanks to the Wikileaks emails, we know the full extent to which she has taken over the Democratic Party, with the full cooperation of the DNC and the party establishment, also the corporate media. This brings us back to the Politics of Vitriol. Our modern communications system and other technologies have increased the volume of public argument to an unholy racket. Our national conversation sometimes feels impoverished as a result….Civility doesn’t just promote decency; it also leads to a fairer exchange of ideas and a greater chance of finding workable solutions to the kinds of problems we face. Peter Jennings: A Reporter’s Life, edited by Kate Darnton, Kayce Freed Jennings, & Lynn Sherr, 2007, p. 124. Astrologers typically assign greater importance to the start of an event rather than its end point; but in this case, the end of The Fairness Doctrine works as a launch chart, as it gave instant legitimacy to the already burgeoning world of Right-wing talk radio shows. Seeking their own alternative outlets in an era perceived as dominated by “liberal media bias,” they were unapologetic in fanning the fires of anger and hatred among listeners. It was just a matter of time before this would spill out into many other levels of public discourse, including television. The chart for the end of The Fairness Doctrine is for Wed., Aug. 5, 1987, Washington, D.C., 12 noon EDT used, as the time is unknown. Look how this chart evokes the emotionality and intensity that comes from one-sided, propagandistic presentations of information. All physical planets are in the emotional water signs (Cancer and Scorpio), with one exception (Jupiter in Aries) and all physical planets are in just three houses, forming a Sankhya Shoola yoga. Shoola means “thorn” in Sanskrit and is associated with struggle and with a “thorn in one’s side.” In a birth chart, this yoga gives a very intense life, with certain major upheavals and opportunities, all depending on the house and sign placement of the planets. For an event chart such as this, we can draw some of the same conclusions reflected in the single-minded intensity that at times may also involve themes of victimization. The two mental planets, Moon and Mercury, are both in watery signs, just as with the chart of the 2016 Democratic National Convention, showing the tendency to emphasize the emotional charge, and in this case also sexual, with the Moon in Scorpio. The Moon and Mars are in a mutual exchange, a Parivartana yoga (Mars is in Cancer, ruled by Moon; and Moon is in Scorpio, ruled by Mars.) This also creates two Neecha Bhanga Raja yogas, as Moon is debilitated in Scorpio and Mars is debilitated in Cancer, but since they are in Parivartana yoga, there is a correction of the debilitation, and the emotional power of Moon and Mars are thereby strengthened. The planetary day is Wednesday, ruled by Mercury, which in turn rules over communications. Situated in the Moon’s sign of Cancer, a watery sign, Mercury is much more emotionally oriented than usual, especially when conjoined with two fiery planets (Sun and Mars), but also not without charm, being close to Venus. Thus, Mercury’s usual aim for discrimination and accuracy gives way to the emotional power and inventiveness behind the message. Neutrality while delivering the message is far less achievable, especially with a strong quest for power shown by Venus and Mars conjoined in the same sign/house. However, the successful spread of a one-sided, more emotional message, with the potential for strong sexual undertones is shown by four planets in the 9th house of long distance travel and communications, as seen from Chandra Lagna, i.e. Moon as Ascendant, in this case Moon in Scorpio conjoined with a powerful Saturn close to its Stationary Direct degree (20:51 Scorpio on Aug. 19, 1987). Sarpa Drekkana comes into play here, with the 2nd and 3rd drekkanas (thirds) of Cancer in Sarpa Drekkana. (The first two drekkanas of Scorpio: 00:00 to 10:00 and 10:01 to 20:00 Scorpio are also Sarpa Drekkana; but Moon and Saturn here are in the 3rd drekkana. Sarpa drekkanas only occur in water signs.) These sectors are snake-like in quality. Natal or transiting planets in this area can be volatile and unpredictable, and sarpa can bring deception. Years later, in Aug. 2011, the FCC formally removed any language implementing The Fairness Doctrine. So from Aug. 5, 1987 onward, the way was cleared in the U.S. for more extreme views to be aired in public broadcasting without presenting the opposite side of the issue(s). This in turn brought increased accusations of media bias, inaccuracies in reporting, and agenda-setting, and thus the creation of powerful propaganda machines for special interests. When The Fairness Doctrine ended, the number of news media outlets was also shrinking rapidly due to Reagan administration policies allowing more and more corporate mergers and less and less regulation. In 1983 there were 50 news organizations that provided 90% of mainstream media news. In the 1950s there were 100s of news organization. But as of 2011, 90% of American media is owned by six news organizations: Comcast, News Corp., Viacom, Disney, Time Warner and CBS. Democratic President Bill Clinton (1993-2001) also furthered the deregulation process. With this consolidation of media conglomerates, and far less money spent on serious investigative reporting, news as propaganda is all the more likely, even from so-called more liberal and enlightened news organizations such The New York Times, The Washington Post, the BBC and The Guardian, whose omissions and distortions are far more apt to be accepted uncritically by their readers. While lucrative for corporations, the problem is that most citizens are unaware this is happening, and assume the news they view is “objective,” since they live in a democratic country. In Russia, for instance, they know they are watching state television and that information may be skewed. As the planet of Truth and Judgment, Saturn is also the ultimate planet of Karma. When it completes one orbit in 28-29 years from an important event, we usually see the karmic fruits of an event or decision made when Saturn was last in that orbital position. (Its orbit averages 29.5 years.) Similarly in the life of a person, the 28th and/or 29th year may be an important turning point, a time of reckoning as to whether life’s big decisions were well made regarding career, marriage, location, health, etc., or whether personal traits or habits were beneficial or detrimental. In 2016 comes the Saturn return to the demise of The Fairness Doctrine, or to put it colloquially – when the shouting began, along with the media frenzy and hype, with facts often disregarded. U.S. intelligence agencies claim it is Russian hackers who hacked into the DNC emails and that they are trying to influence the U.S. Election and damage Clinton. Wikileaks’ Julian Assange and others say there is no evidence that Russian intelligence is involved and still others say the Clinton campaign is too quick to blame the Russians and distract from the content of the emails. Even so, the U.S. has long spied on other nations, and nations typically spy on each other. But this makes cyberwars and cybersecurity again headline news. Cybersecurity experts including Edward Snowden say the NSA has the tools to determine the hacker, but may not want to reveal who it is. In such a situation, false rumors can be spread to foment more anti-Russian sentiments, which Clinton is known to share. In late July 2016 Assange promises to release more emails with more big revelations about Hillary Clinton and/or related to the 2016 U.S. Presidential Election. It may possibly relate to her two criminal F.B.I. investigations. Roger Ailes is forced to end his 20-year reign as CEO at Fox News, brought down by a lawsuit accusing him of sexual harassment of one his female employees. Others confirm this sexist tone is endemic to Fox news, which he encouraged, both on air and in the workplace environs. Even as the tempo of the news can rise and fall by the minute, it seems that none of these other events hit the headlines with quite the same impact as the news about Roger Ailes and his abrupt and stunning fall from power as Fox News CEO. 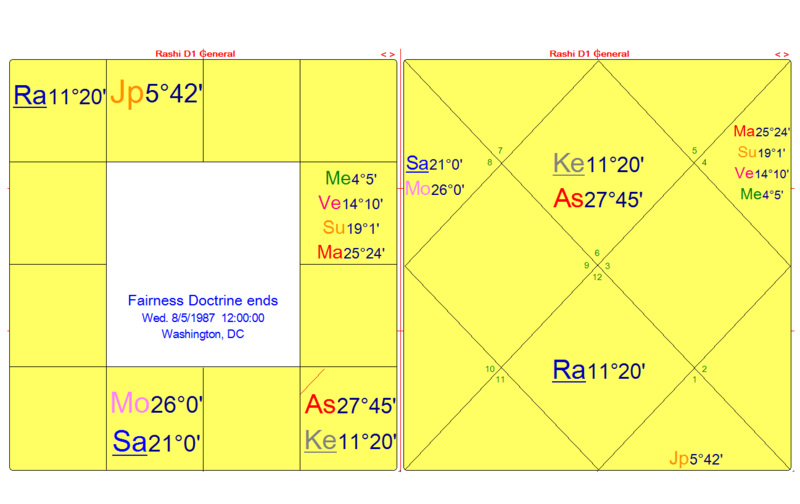 It was announced at the closing bell on Wall St. (4:00 pm EDT) on Thursday, July 21, 2016, and within 3 weeks of Jupiter (journalism) leaving the sign of Leo, where for 13 months it has been conjoined with Rahu (the renegade outsider). We would expect to see the media shaken up while Jupiter conjoins Rahu. In 1970-71, Roger Ailes was a Republican strategist working for Richard Nixon, and Nixon’s first-ever “media adviser,” a term Ailes invented in 1968, helping Nixon to win the 1968 election. Ailes dreamed of establishing a news outlet that would provide only Right wing, conservative-based news. That was 17 years before The Fairness Doctrine was abolished and 26 years before media mogul Rupert Murdoch approached him to head Fox News. As discussed earlier, the year after the doctrine was abolished, Roger Ailes and Lee Atwater launched a totally new level of political attack ads, enabling Republican George H.W. Bush to win the presidency in 1988. Then in 1996, Rupert Murdoch wanted to compete with CNN, the world’s first 24-hour television cable network, from June 1, 1980. Fox News made its debut on Oct. 7, 1996, and not only did it compete with CNN, but surpassed it as of 2002. From then on Fox News has been the top-rated cable network and Murdoch’s top producing entity within News Corporation. I watch with the greatest satisfaction the fall of Roger Ailes, a man who singlehandedly has done more damage to journalism and the role it plays in a healthy democracy than almost any single individual I can think of (ok, maybe Rupert Murdoch belongs by his side). Under his two-decade-long stewardship, the founder, Chairman and Chief Executive of Fox News was instrumental in creating the political golem that is Donald Trump…. No one who cares about truthful information and honest discourse will mourn the passing of the Roger Ailes era of media dominance. Monitoring the movements of Mars and Saturn in spring 2016, we note that Saturn turned Stationary Retrograde on March 25th at 22:20 Scorpio; and Mars turned Stationary Retrograde on April 17th at 14:49 Scorpio, giving them more power near SD and SR points. Since the start of the year and from fall 2015 Ailes was going through some contract negotiations with Fox anchor Gretchen Carlson. He had demoted her several times and finally fired her on June 25, 2016. Soon after, on July 6th, she filed a lawsuit against Ailes and Fox News, claiming that due to his ongoing sexual harassment she had lost her position and was fired from Fox News. Ailes fought back, but there were too many other women coming forward (25 of them), including most importantly, Megyn Kelley, a star broadcast journalist at Fox News whom Ailes had groomed since 2005. However, she too had experienced sexual harassment from Ailes, and the parent company, News Corp. was swift to take action, giving Roger Ailes a choice of resigning or be fired by August 1, 2016. He was barred from the Fox News headquarters in mid-Manhattan, NY as of Wed. July 20th, and his resignation from Fox News was announced the next afternoon. Notice how once again, as with the previous chart, there are multiple planets in water signs: Mars and Saturn in Scorpio; Sun, Venus and Mercury in Cancer. Except for the faster moving tr. Moon, all planets remain in these signs throughout the Republican National Convention, July 18-21, 2016, and the Democratic National Convention, July 25-28, 2016. The Moon soon moves out of its Full Moon sign position; and in just over six hours after Roger Ailes’ resignation was announced, Donald Trump gave his acceptance speech at the Republican National Convention, starting at 10:08 pm EDT, Cleveland, Ohio. The Ascendant is 2:58 Aquarius, and the Moon is close to rising at 2:14 Aquarius. This echoes Trump’s natal chart with his Leo Ascendant and five planets in fixed signs. It was fortunate timing for him to have a Jupiter aspect to both Moon and Ascendant. His speech was well received by his supporters, especially when he said: “I am your voice.” From his opponents and critics, Trump’s speech was called “a dark speech,” one that warned of many dangers that only he can fix. Former NYC mayor Michael Bloomberg called Trump “a dangerous demagogue,” re-igniting a feud between them. The next day, July 22nd, Wikileaks unveiled its large trove of hacked DNC emails, over 20,000 pages. As a result, the Democratic Party establishment, within just three days of its national convention and on the day the VP is announced, scrambled for cover, blaming Russian hackers to de-focus from the DNC emails. Accusations of cyberwar raced across the headlines. All of these emotional events, some of them driving instant conspiracy theories, were happening with Mars and Saturn in Scorpio soon to approach the degrees of Saturn Stationary Direct (Aug. 13) and the Mars-Saturn conjunction (Aug. 24). Meanwhile, absent from most corporate news was any mention of the massive vote fraud that occurred during the Democratic primary races, changing the outcome from Sanders to Clinton, notably the historic levels of vote fraud in California. But with key planets in Scorpio, some secret intrigues and power struggles reside just under the surface, and others will be released, in this case with a vengeance. Roger Ailes was born Wed. May 15, 1940 in Warren, Ohio, no birth time available. The most salient feature of his chart is the combination of three planets in the 9th house from natal Moon in Leo: Jupiter, Saturn, and Mercury in Aries, in that order, with Mercury as Atmakaraka, planet at the highest degree of celestial longitude, and thereby strengthened and made prominent. Mercury is also the day lord of Wednesday, gaining for it yet more importance. Together the three planets form Raja and Dhana yogas for success, fame, and financial wealth. From the Moon as Ascendant, this is due to Mercury’s ownership of two financial houses (House 2 and 11), Jupiter’s ownership of a trinal house (House 5), and Saturn of an angular house (House 7). 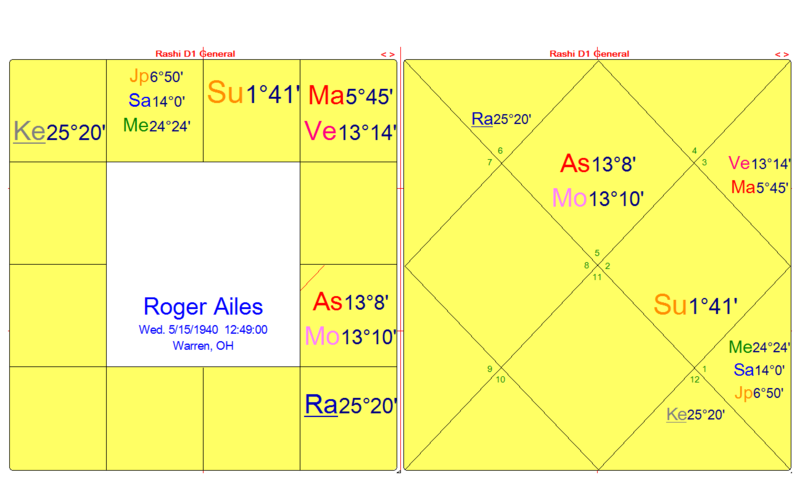 Ailes was born in the midst of the triple JU-SA conjunctions in Aries, 1940-41, always a major significator of the times, and in this case a marker for the start of the Atomic Age. He was born and lived in one of the most intensely accelerated centuries in modern history, one containing two sets of triple JU-SA conjunctions within 40 years. As a reminder, the triple JU-SA conjunctions in 1980-81 in Mercury-ruled Virgo would launch the Information Age. With his Moon well situated in relation to Jupiter and Saturn to take advantage of the period, he also has Sun in Taurus in the 10th house (of career and social status) from the Moon, and Venus and Mars conjoined in Gemini, a combination that brings a quest for power. And in Gemini, that quest can be both political and/or sexual – ironically the very thing that brought him down. 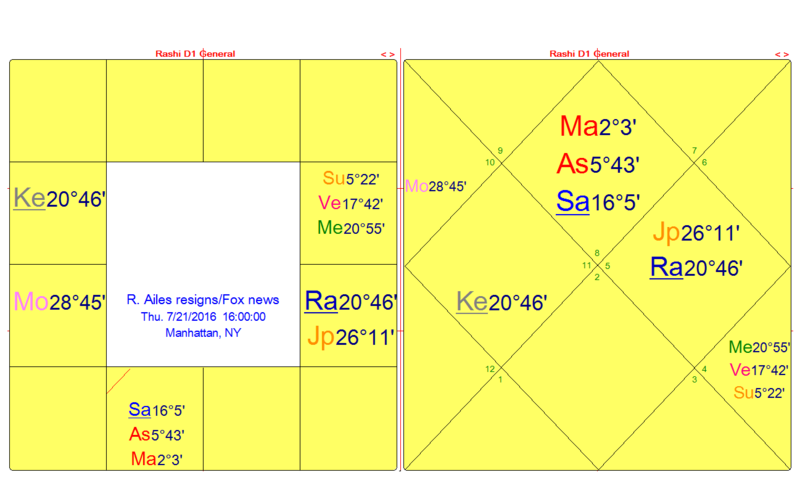 Lastly, Roger Ailes has a Kala Sarpa yoga (literally “Time Serpent” yoga), when all planets are contained between Rahu and Ketu, the eclipse axis. A Kala Sarpa yoga indicates that the life is more fated and less dictated by the person’s own will. With other positive yogas present, as in this case, the Kala Sarpa yoga enables the person to play a major part in changing the society in which he or she lives. Donald Trump also has a chart with a virtual Kala Sarpa yoga. 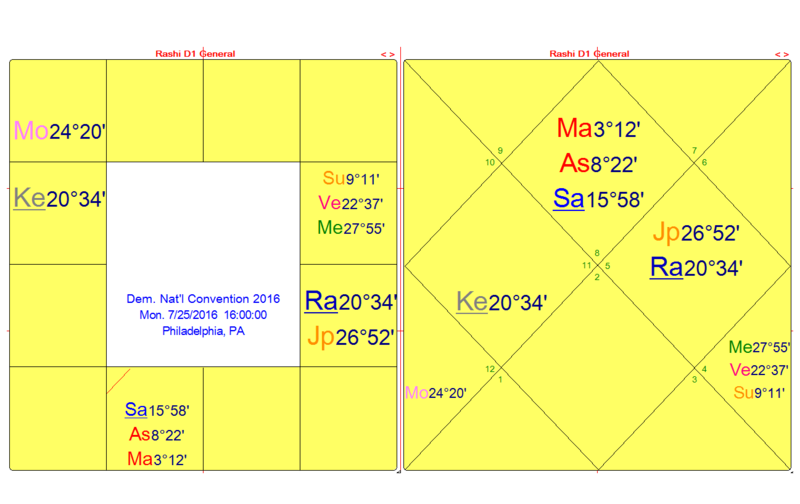 His Full Moon across Taurus-Scorpio is within 26’ orb (less than half a degree) of Rahu and Ketu: Sun-Rahu in Taurus in the 10th house opposite Moon-Ketu in Scorpio. Roger Ailes and GOP Presidential candidate Donald Trump are good friends, as it happens, though they have had their spats, including when Trump refused to attend the 2nd GOP debate at Fox News. Ailes has been called Trump’s “ideological godfather.” They advise each other, and Trump spoke compassionately about Ailes’ fall from power, vouching for his good character and bemoaning his fall from grace, complaining that the women he advanced had turned against him. In this way, the two men are similar in their perceived stance towards women, with their sexism and misogyny, though Trump’s wife and daughters might say otherwise. Trump’s acceptance speech occurred within six hours of the announcement of Ailes’ downfall – a dramatic coincidence, especially as many consider that the very brashness of the Ailes media style enabled or in fact even created the possibility of the Donald Trump phenomenon. Some strong Leo influence would be likely for this to occur, and we do see this with Ailes’s Moon in Leo and Trump’s Ascendant and Mars in Leo, also his powerful combination of planets all in the fixed angles of the chart, including a Full Moon, and Sun in the 10th house of maximum visibility. Trump uses many forms of media very effectively, fascinating his supporters and the world at large, having the adept’s almost genius capacity to combine intuition with media savvy. He also had his own television show (The Apprentice) for 14 seasons, from Jan. 2004. There is absolutely no precedent for this kind of media savvy among GOP (or any) presidential candidates, so perhaps it could be said that Roger Ailes “passed the baton” to Donald Trump on Thurs. July 21st in a similar way that President Barack Obama “passed the baton” to Hillary Clinton on Wed. night, July 27th. Unfortunately the latter only reinforced Republican charges of an “Obama 3rd term,” and downplayed her image as a “change-maker” (husband Bill Clinton’s description of her in his speech July 26th). When Richard Nixon told Ailes in 1968 that he regarded television as “a gimmick,” Ailes told him he would lose the 1968 election if he did not learn to master it. Now we live in a time when television is still pivotal, but political candidates must find ways to reach the public through a dizzying array of media platforms. THE PRETENSE OF DEMOCRACY IN THE U.S.
As noted in my previous Election 2016 Update (June 27th), the intensity of 2016, especially through summer and fall, will show either that the dominant patterns of the EARTH period (1961-2199) to date cannot be broken and will be further consolidated, or that some bold steps can be made at this time to counter the heavily materialistic trends and the corporate control over the workings of government. The alleged massive vote fraud/theft from Bernie Sanders during the 2016 primaries has not yet been covered in the corporate media, though it HAS broken through at the protest marches and public gatherings inside and outside the Democratic National Convention, July 25-28, 2016. But since Hillary Clinton has now been nominated, there is only a small window left in which the election trajectory could be altered. And since corporate news continues to censor by omission this major story, it seems a sure sign that the oligarchy is firmly in control, and that current EARTH period trends are deeply entrenched and likely to continue to protect the oligarchs at the expense of everyone else. They hope in turn that the populace remains ignorant and distracted so they can retain control. Their chosen official (Clinton, in this case) will be appointed to office, however it can be arranged. Meanwhile every effort will be made to appear like a functioning democracy. Her birth chart has shown numerous times when she should have lost prominence as the front-runner. But each time she countered the odds. It would also appear that she had the help of many operatives and vote fixers to help her defeat her Democratic opponent. The DNC emails from Wikileaks make the collusion very clear. Vote fraud lawsuits will display the rest. The Democratic Party establishment seems to have successfully engineered a “coup d’état” on behalf of Hillary Clinton, with vote rigging beyond anything yet seen in American history, including in a primary race. So it was with stunning hypocrisy that Hillary Clinton announced on Wed. July 27th: “Let’s make it easier to vote, not harder,” and promising the next night that she would address voting rights in her first 100 days in office. It is small wonder that Bernie Sanders supporters and delegates continued their walk-outs and acts of protest throughout the convention, knowing how the votes had been stolen from Sanders in state after state. The dazzling speed and convenience of our modern information technology in the EARTH period (1961-2199), especially from 1980-81 (the triple JU-SA conjunctions in Virgo) changes our elections in a profound way, because with exponentially more information available digitally and easily documented, the more a candidate and their campaign can change the facts at any time, spinning the moment to his or her advantage and to the opponent’s disadvantage. This may involve surveillance, computer hacking, and vote rigging, as discussed. It seems contradictory to what should happen if you have proof of inaccuracies or wrongdoing, but in another arena, we have seen the many instances where those who document police violence against unarmed citizens are harassed and criminalized for merely documenting the incidents. In addition, the 20-year reign of Fox News, under the stewardship of Roger Ailes, has pushed for speed and glamour above and beyond factual accuracy and serious news gathering, and this practice has spread to other news organizations. A politician or political candidate may lie repeatedly, as do both Clinton and Trump, but the speed and spin of the news media is so relentless that politicians count on it to move on quickly to the next news cycle and obscure the previous one. In such a world, misinformation can become indistinguishable from real information. Therefore, those in power can hide behind many smoke screens. Gaining cooperation from the public would become surprisingly easier, even in democracies, through consolidation of the media. This increased dramatically in the EARTH period, even more so after the rapid acceleration of information technology from 1980-1981, easing the way towards control of the media and the message. The author, In Search of Destiny, 2012, p. 26. Though Ailes is now out at Fox News, it seems unlikely that the media style they unleashed in 1996 will suddenly disappear, having profited in turn from the end of The Fairness Doctrine in 1987. It also seems unlikely that the cyber world loses its hold on the populace – unless there is a so-called “Black Swan event,” a natural or man-made event that causes massive media blackouts. Perhaps only this would bring a complete reassessment of our media ways and habits, our life in cyberspace. All this we face in the last four years leading up to the Jupiter-Saturn conjunction in Capricorn, Dec. 21, 2020. It will be a powerful one, falling on the Winter Solstice in the northern hemisphere. And nothing we have seen to date indicates that the nations of the earth are significantly able to constrain their corporate overlords from seeking power and profits over the Public Good. (Their Public Relations may say otherwise, of course.) Many of them, especially those that are Right-leaning, do not acknowledge the science of climate change, or anything that threatens the piling up of profits to the exclusion of all else. This is the world of materialism that commodifies information and uses it to manipulate public opinion. The first JU-SA conjunction in an EARTH sign in the 20th century occurred on Sept. 9, 1921 in Virgo. And though it was still in the FIRE to EARTH Mutation period (1901-1961), it was a marker for the first major propaganda campaigns in the U.S. The man who pioneered the Public Relations industry was Edward Bernays (1891-1995). He believed the manipulation of public opinion was necessary, especially in a democracy; he created “false realities” that became “news events,” a model often copied throughout the EARTH era, but especially after the triple JU-SA conjunctions in Virgo, 1980-81. Bernays worked on behalf of governments and corporations to promote their products, campaigns, or wars (e.g., U.S. entry into World War I). He opposed “muckrakers” (reform-oriented journalists) as unpatriotic, and his work contributed greatly towards eliminating them after WWI. He re-branded the slaughter of the First World War as “necessary and noble.” His book Propaganda was published in 1928. Thus, in so many ways Bernays was an important precursor to the more brash Roger Ailes, who had much more technology at this disposal, and whose Fox News reign started the year after Bernays died. But Bernays achieved a lot and he knew the value of sowing the seeds of doubt, as happened for decades with the tobacco industry, and is happening now with climate science. Unfortunately, as the most successful modern media well knows, and as Ailes and Fox News have trained the rest of the media organizations, the greater the speed and emotional/ sexual flash in the news, the more likely the content is to attract larger and larger audiences, even if the content is negligible or inaccurate. The masses are more likely to be magnetized to the sensational aspect and not to the seriousness of the content. For an election so steeply enmeshed with the media, both corporate and independent, this Saturn return to the end of The Fairness Doctrine has many repercussions in 2016. It seems unlikely to be a time of reckoning or pulling back, as stated earlier, unless some event forces a change in our entire outlook. But would that change the attitude about commodifying information? Perhaps it is too deeply built into this EARTH period, and we see this happening with the ongoing corporatization of education, among other arenas, and in a world that seemingly values “the business of information” (Saturn) over deeper, truer knowledge (Jupiter) that is not propagandized and that contributes to ethics and to the humanities. In such an era in the United States, we find ourselves poised to elect Hillary Clinton as President. At this point she is threatened by Donald Trump’s good poll numbers. But we have to know now that the oligarchy wants her. And Trump’s timing declines after Aug. 11, 2016, when tr. Jupiter exits Leo (on his Ascendant) and enters Virgo, his 2nd house. https://www.youtube.com/watch?v=MGnH75jZCGg Election Justice USA Releases New Report [July 18, 2016]: An Electoral System in Crisis. Special thanks to Lynn Bootes for research assistance on the date/time for the Roger Ailes resignation announcement, as well as various date/times throughout the Democratic and Republican National Conventions, July 2016.